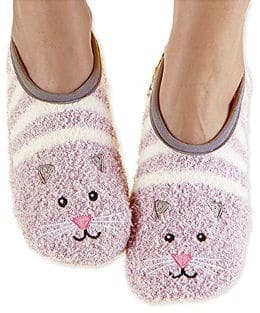 If you love cats, there is no way you won´t also love wearing a super cute pair of cat slippers for adults. In that case, your beautiful cat slippers will probably attract some attention by your cat as well and may even become their favourite game. 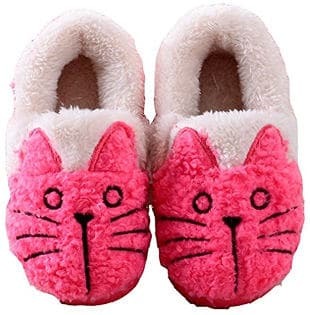 Cat slippers are not only great slippers for cat owners and lovers but can also make great gifts for anyone that likes fun and cute designs of slippers and especially animal slippers. 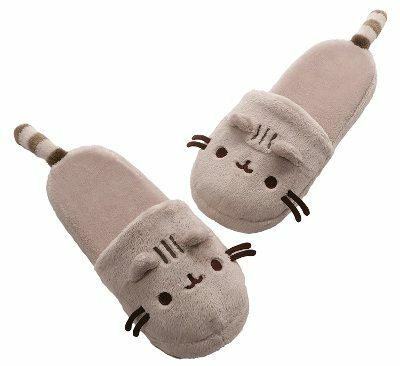 So, here we have 20 of the best cat slippers for adults, hoping you will love them as much as we did when we first selected them for this review. 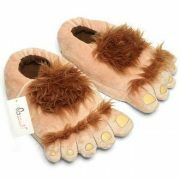 As the company indicates, this Snoozies home footwear is something in between a slipper and a sock. It is surely lightweight, feels cozy and looks extremely cute. It is available in many different animal designs including a smiling grey cat with a pinky nose in the shape of a heart. 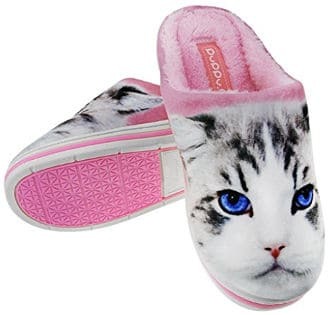 This cat slipper is made from 100% Polyester and the sole has memory foam that makes it comfy. 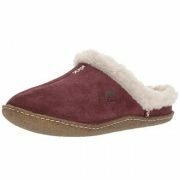 The lining is soft fleece and there is a skid-resistant outsole that is most suitable for indoor use. In addition, it doesn’t make your feet sweat and can be machine washed in cold water. This is another pair of cat slipper socks by Snoozies which looks incredibly cute and fun. When you put each slipper of the pair one next to the other, they tell a short story. This comfy, warm and soft footwear has soft outsoles with rubber dots and cushioned soles that are good for hard floors. It is available in 4 women´s sizes: Small, Medium, Large and X-Large. MiYang Cat Slippers look very pretty and are available in sizes for both women and girls. They come in some beautiful colours and look fuzzy and warm. Users find them very warm and super cute. They like all the bright colours available and say that they have a sturdy sole. Some of the people recommend ordering one size up or wearing them for a little while till they loosen up. 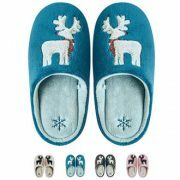 These cat fabric clog slippers by Haflinger look really pretty and cozy. They feature a boiled wool upper with felt applique that portrays a split kitten. They also have a contoured foot bed, a double wool felt sole and latex arch support. On the bottom, there are traction dots for safer use on tile and wood floors. According to users´ reviews, the lining does not feel itchy at all and is soft, warm and breathable. These cat clogs feel very comfortable and are sturdy. 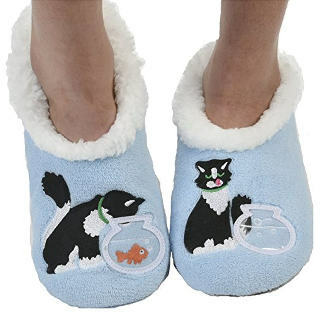 If you don´t want just a pattern of a cat on your slipper but you want a more realistic version of a cat, then the ¨Happy Feet¨ Animal Slippers offer an nice version of an orange cat slipper. 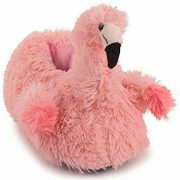 ¨Happy Feet¨ Slippers are available in a wide range of different animal slippers that look really fun and you can find sizes for the whole family. They are made from polyester and are nicely cushioned. 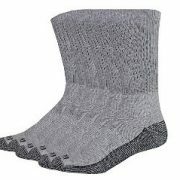 They feel warm without making feet sweat and they are only suitable for home use. 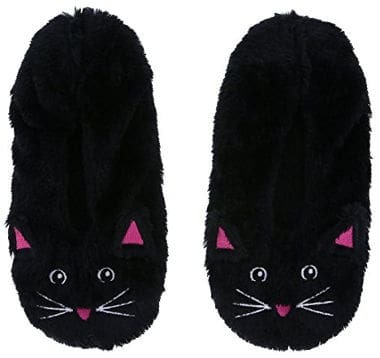 These Snoozies cat slipper socks with a pull on closure are made from polyester and are machine washable. 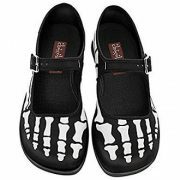 They have gripper dots on the bottom and there is one size available that fits women´s shoe sizes 5-10. Users find these slipper socks adorable and comfy as well as soft and light weight. Nevertheless, some people say that the foot opening is not so stretchy or flexible and also that the heel is large. 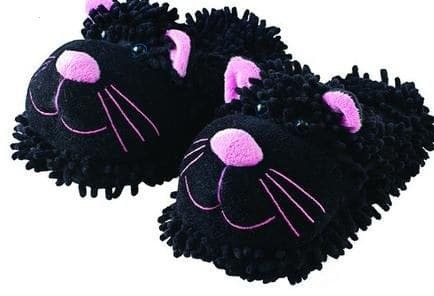 They might look like a mop and may occasionally serve as one, although it is not recommended, but these fuzzy black cat slippers have lots of other things that make them a good buy for yourself or to offer as a gift. Users like that they feel comfy and cozy, keeping their feet in the right temperature. They are available in one size which, according to the seller, it fits most, and the sole is non-skid. Nevertheless, not everybody is pleased with the durability of this product. 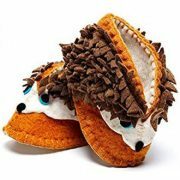 Zoe´s slippers are available in many different cat options as well as a pair that is half cat and half dog. 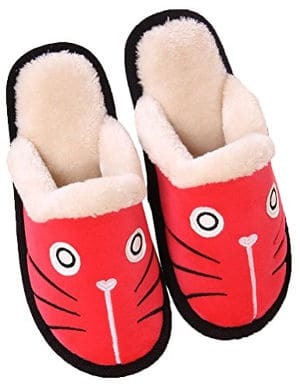 There are also ¨Hello Kitty¨ slippers´ designs in some bright colours. The red cat slipper in the featured image above is also available in pink and black. 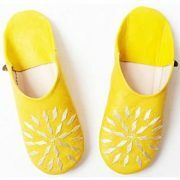 These clogs are available in sizes both for men and women and are made from cotton and flax. They look like decent quality slippers and quite sturdy as well. The outsole is made of rubber and is anti-slip. 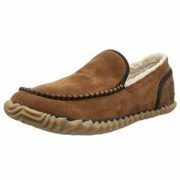 Users like that this footwear is soft on the inside as well as comfy, warm and really sturdy. It has thick soles and the outsole grips nicely. 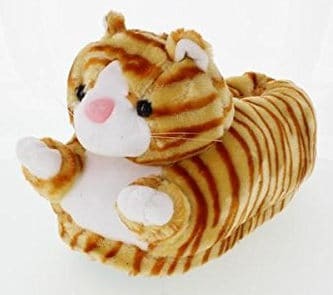 These plush cat slippers by GUND feature accurate details like an extremely cute striped tail, whiskers and more. They are sized for women, with one size fitting most which goes up to 10. They are 12 inches long and their surface is washable. On the bottom, there are these little rubber dots. Users say that they feel very comfortable and are plushy, super soft and simply adorable. LA PLAGE Cat slippers look adorable and can either be hand or machine washed. The lining is wool-like while the anti-skidding outsole is a mix of rubber and leather. 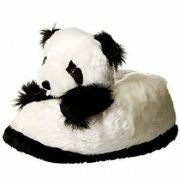 According to the manufacturer, this lovely slipper is good even for extra wide feet. 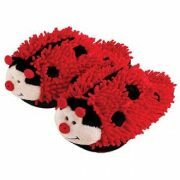 Users review that these plush slippers are comfy, super cute and warm. 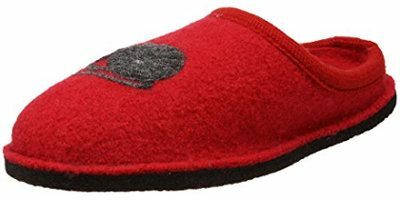 This Haflinger kitty slipper is a beautiful and toasty clog slipper. 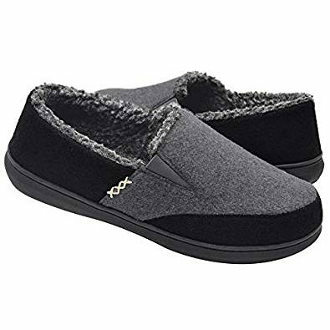 The upper and the lining are 100% made from boiled wool while the foot bed is padded and the outsole is double felt with coating on the bottom that is non slip. The heel measures 0.5 inches and there is some arch support. Few users have reported problems with finding the right size for them. 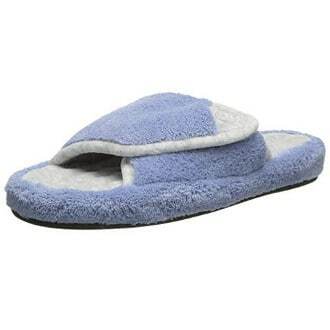 Otherwise, people love these slippers because they are unique, comfortable, quiet, cozy and warm without making feet sweat. 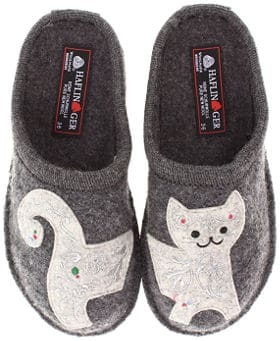 These open-toe cat slippers are made from cotton and flax. They are available in one size that fits most, and can be either hand or machine washed. They also come in three colours. Users like them because they are cute and comfy. They are also lightweight but not cushiony. They fit great and feel sturdy. 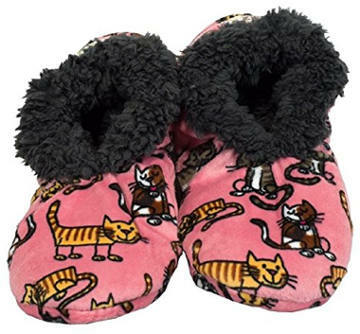 These slipper socks by Fuzzy Babba are very pretty and are available in a ¨black cat with pink ears and nose¨ design among other very cute looking animal socks. 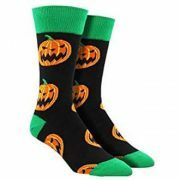 They are made from polyester and have gripper bottoms. They can also be machine washed in cold water. Users find that they have a nice cushion in the sole and are comfy and soft. 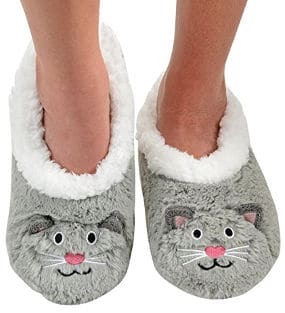 These fun print cat slippers are made from polyester fleece and are available in sizes Large and X-Large which fit women 7-9 as well as big kids. 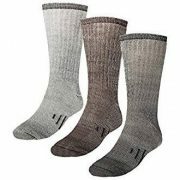 Users review that they are warm, comfy and soft. They are also roomy for women with wide feet and there are little rubber dots on the bottom which provide some anti-slip protection. 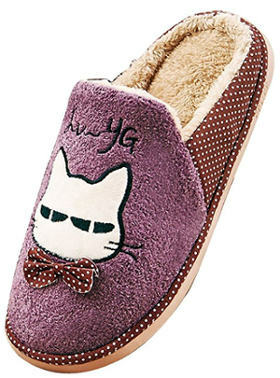 MiYang Cat Print Slippers look really pretty and are available in three nice looking colours. They are cotton lined and can be machine washed in cold water. They are also lightweight, non-skid and breathable. Users find that they are well made as well as comfy and super soft on the inside. They also like the fact that they have hard bottoms, which is particularly useful when they have to rush outside. 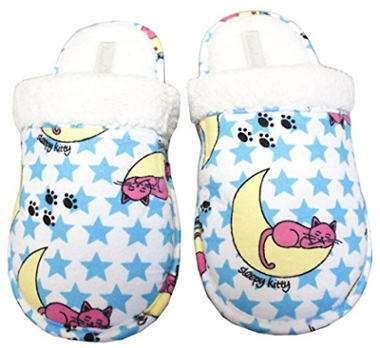 These cute bootie cat slippers are made from polyester with a textile sole which has tiny rubber dots. One size fits most and they are suitable for indoor use only. They are also surprisingly cheap. 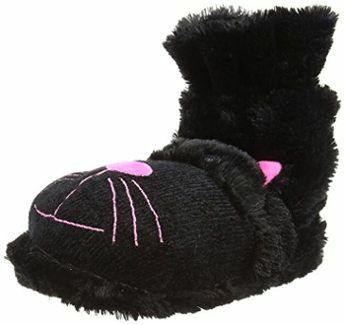 Users say that these cat booties feel really cozy and warm. They make a good idea for Halloween costumes as well. Nevertheless, few people mentioned that they run small. 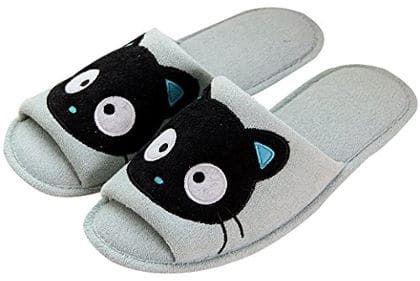 The sleepy kitty design on these slippers makes them a great looking bedroom slipper. They are made from 100% cotton and feature a cotton flannel upper, foax-shearling lining and a non-skid outsole. There are also pajamas as well as lounge pants and boxers available in the same design. 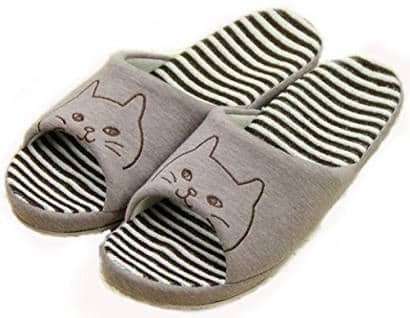 Users like these cat slip-ons because they are warm, cuddly and soft. They are not the most supportive slippers ever but they look really nice. These white cat home slippers are cartoon animal print style and designed for both women and men. 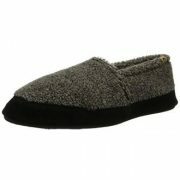 They are made from velvety fleece and have a rubber anti-skid outsole and a waterproof design. This product also comes a drawstring bag that works great for travelling or storing. 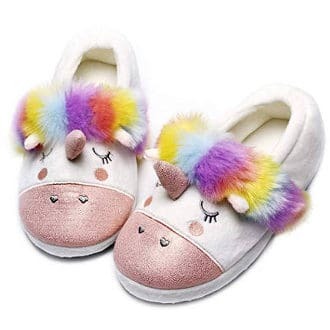 Users like that these slippers are comfy and cute but they recommend that since they run a bit small, you should order a size up. These are cute cotton and linen home slippers, and are non-slip. People review that they are not so solid but they look very cute. Some users also say that they don´t feel comfortable but feel hard. 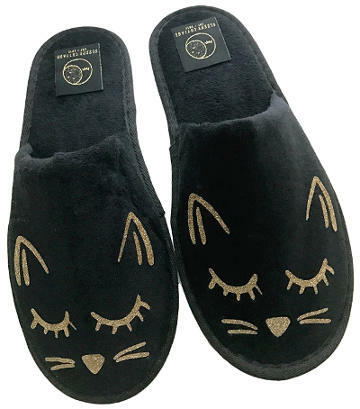 These Black and Gold Cat Slippers look very pretty and are handmade. They are made from Terry cloth cotton and come in a travel storage bag. This looks like a thin and lightweight slipper to wear and there is no information provided about the existence of any cushioning. Finally, it is 11.5 inches long. 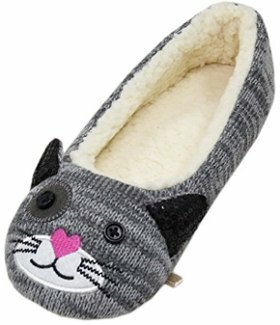 All in all, cat slippers for adults make great gifts for cat lovers or for whoever wants to wear a fun and really cute home animal slipper.